North Carolina has over 4000 native plant species. 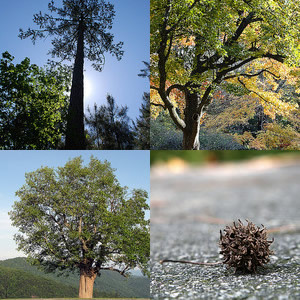 North Carolina is home to 26 endangered plant species in the United States. North Carolina has over 700 rare plant species, and 162 of these are threatened or endangered in North Carolina. The wide variety of landforms found in the three regions of North Carolina is evident in the extreme range of vegetation throughout the state. Click on one of the three regions below to see a list of some of the most common plants found in each region. Marshes and dunes are predominate vegetation types in the Outer Coastal Plain. Additionally, there are areas of preserved forests, which include: Nags Head Woods Preserve of the Nature Conservancy, Hatteras Woods in Buxton, and others scattered throughout Bougue Banks. The Inner Coastal Plain is home to many swampforests and hardwood swampforests, a a feature which distinguishes it from the the Tidewater sub-region of the Coastal Plains. The Mountains have two distinct areas of vegetation: the Deciduous Forests, which have more species of trees than all of Europe combined, and the Boreal Conifer Forests. "Education," North Carolina Native Plant Society, accessed January 24, 2019, https://ncwildflower.org/native_plants/education. Orr, Douglas M. The North Carolina Atlas: Portrait for a New Century. Chapel Hill, NC: University of North Carolina Press. 2000. 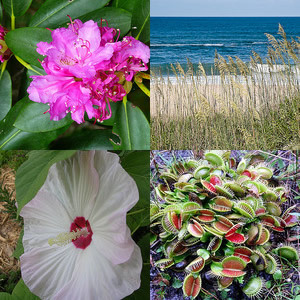 "The NC Natural Guide to Coastal Flowers of the NC Coast Barrier Islands," Last modified 2003, http://www.ncnatural.com/wildflwr/coastal/index.html (accessed April 3, 2012). "Native Plants of North and South Carolina," Plant Native, http://www.plantnative.org/rpl-ncsc.htm (accessed April 3, 2012). Photo courtesy of NC Hiker, "Pink Rhododendrom," Posted June 14, 2011. Photo taken at Roan Mountain. Available from http://www.flickr.com/photos/nc_hiker/5839567616 (accessed April 4, 2012). Photo courtesy of NC Orchid, "Venus Flytraps", posted on October 1, 2004. Available from http://www.flickr.com/photos/ncorchid/47549994 (accessed April 4, 2012). Photo courtesy of Flickr user Bumeister1, "Sea Oats and Ocean Surf." Image posted on July 18, 2008. Photo taken at Cape Hatteras National Seashore, Outerbanks, NC. Available from http://www.flickr.com/photos/bumeister/2793592794 (accessed April 4, 2012). Image posted by Flickr user 'Greenery', "Swamp Mallow (Hibisbus Moscheutos)". Image taken on June 21, 2006. Available from http://www.flickr.com/photos/greenery/208097577 (accessed April 4, 2012). Photo courtesy of Flickr user Konomike. "Loblolly Pine." Photo taken in Johnston County, NC. Posted on April 26, 2009. Available from http://www.flickr.com/photos/baltimike/3478126998/ (accessed April 4, 2012). Photo courtesy of Flickr user Bumeister. "Oak Tree and Bench". Image taken in Chapel Hill, NC on UNC-Chapel Hill's campus. Photo taken on November 19, 2007. http://www.flickr.com/photos/bumeister/2166787092 (accessed April 4, 2012). Photo courtesy of Flikr user BlueRidgeKitties. "Tulip Poplar!" Photo taken on May 20, 2010 in Laxon, NC.http://www.flickr.com/photos/blueridgekitties/4625196819 (accessed April 4, 2012). Photo courtesy of Flickr user Ivy Dawned. Photo taken on September 24, 2008. Available from http://www.flickr.com/photos/blueridgekitties/4625196819 (accessed April 4, 2012). Photo courtesy of Flickr user Soil Science. "Christmas Tree Production." Photo taken on October 19, 2010. Available from http://www.flickr.com/photos/soilscience/5097054069 (accessed April 4, 2012). Photo courtesy of Flickr user BlueRideKitties. Photo taken on June 3, 2011 at Grandfather Mountain, NC. Available from www.flickr.com/photos/blueridgekitties/5802076402/ (accessed April 4, 2012). Photo courtesy of Melina Stuart. "Hemlock at the Church." Photo taken on January 7, 2011 on the Blue Ridge Parkway. Available from http://www.flickr.com/photos/melystu/5333639810/ (accessed April 4, 2012). 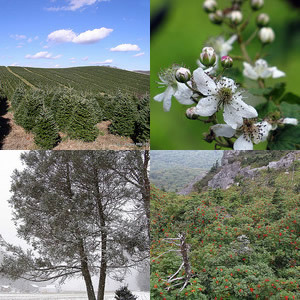 Photo courtesy of Flickr user 'BlueRidgeKitties', "Mountain Ash." Photo taken on September 4, 2011 at Grandfather Mountain, NC. Available from http://www.flickr.com/photos/blueridgekitties/6116641888/ (accessed April 4, 2012). Do you know where I can find a list of plants native to the Piedmont of North Carolina which are edible by humans? Not "wild" plants, but native plants. The NC Botanical Gardens at the University of North Carolina has a very knowledgable staff. I would suggest contacting either Laura Mindlin, the Edible Campus Program Manager, at 919-962-9633, or Alan Weakley, Director of the Herbarium, at 919-962-0578. I hope you find what you need. Please feel free to respond back here with more questions or comments. Why would different parts of North Carolina have different plant species? The diverse geography of North Carolina creates different ecosystems in each of the regions which support very different forms of plant and animal life. You can learn more about the regions and our state's geography here: https://www.ncpedia.org/geography-0. I hope this helps answer your question. Please feel free to respond here with any other questions. Christopher Luettger - NC Government and Heritage Library. Are you looking for information about other plants that are not shown on this page? If so, please let me know what plant or plants you're interested in and I will try to help you find information. This page lists common species -- if there is something missing that we should include, I would be happy to investigate and add it. If you're interested in photos of plants, we unfortunately can't get an image of every plant on the list onto this page. But if you're interested in a photo of a particular plant you may want to search for that plant in NCpedia. If we have an article on the plant, there is most likely a photo to go along with it. Please let me know if I can help you find additional information. How many plant species are in the United States of America????? That's a good question! You might find this page at the U.S. Department of Agriculture helpful for answering questions about plant species in the U.S.
Librarians at your local public library are also a good resource for helping find answers to questions like yours.